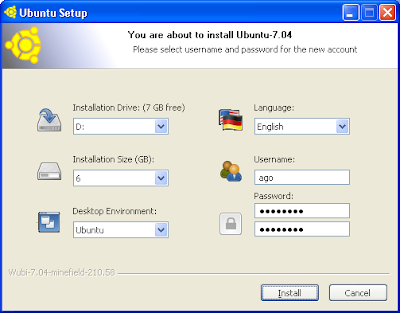 I saw an article about installing Ubuntu on Windows at Ubuntu-Unleashed Blog. It talks about an open source project called "WUBI". Premise is very simple: You install an application called Wubi on Windows XP/Vista which uses an "alternate" (text based) Ubuntu ISO file to install Ubuntu in the windows partition in a 'single file' and give you an option to boot into it. What does that mean? You do not need to have separate partitions to install linux/windows. It installs necessary drivers to access NTFS share, and does pretty cool stuff like importing your favorites/booksmarks. When I was testing the application, which you can download via this link, it could not connect to a download site for ubuntu alternate image. So, I checked c:\wubi\install\ubuntu-7.04-alternate-i386.iso.metalink and used one of the US sites to download it. I copied both the alternate image and wubi executable to the same directory and then ran the executable. GUI part is quick, actual installation takes sometime. It's advised to defrag your machine prior to installing it. This is a cool idea and I hope it gets official acceptance from Ubuntu! Check out Wubi Forums if you are interested.